Fabian Quoss has taken down the €50,000 buy-in ‘single-day’ high roller event at the 2016 European Poker Tour Grand Final, outlasting a field of 70 entries to win €849,059 ($967,927 USD). 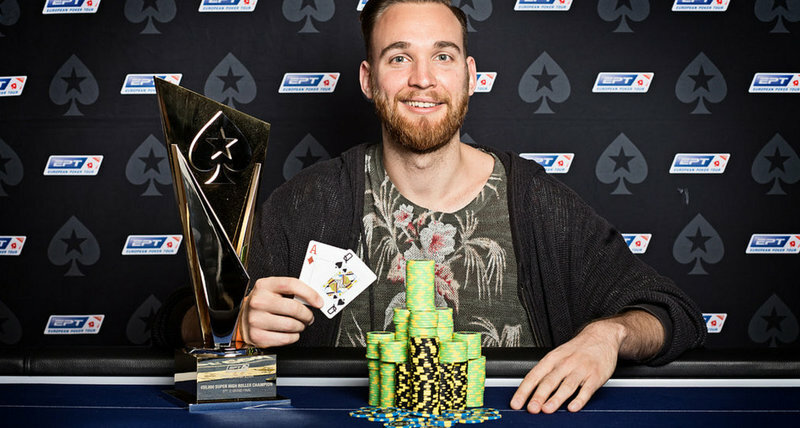 The event was scheduled to be completed in one day, but the conclusion was pushed back after play was halted at 5:30 AM local time with just Quoss and recent EPT Grand Final €100,000 super high roller champion Ole Schemion remaining to battle for the title and the top prize. The two returned at 9:00 PM after the conclusion of day 2 of the EPT Grand Final main event. At the resumption of play the two agreed upon an ICM-based deal that saw Schemion lock up €857,241 as a result of starting with nearly a 3-to-2 chip advantage while Quoss secured at least €799,059. That left €50,000 and the title to play for. Quoss found a quick double up to overtake the chip lead and shortly afterwards was able to land the finishing blow. In the final hand Schemion shoved his last 12 big blinds all-in from the button with the K 5 only to get called by Quoss’ A Q . The board ran out A 8 4 Q 3 and Quoss hit two pair to secure the pot and the title. With that Schemion fell just short of winning two massive high roller events in the span of a few days. The $2.8 million in USD the 23-year-old poker pro added to his career lifetime live earnings this week were enough see him overtake the lead as the all-time money leader amongst German players with over $11 million, supplanting Tobias Reinkemeier. Quoss’ win brought his career live earnings to more than $9.1 million, moving him into fourth place on the aforementioned German money list. In addition to the title and the money Quoss also earned 714 Card Player Player of the Year points. This was his third final table and second title of the year, having also taken down the $100,000 high roller at the Aussie Millions in January. With 1,614 total points and year-to-date earnings of $2,650,290 Quoss has moved into 27th place in the overall standings. Schemion, who was at his fourth final table of the year, now has 1,695 points and $2,853,675 in 2016 earnings to his name, enough to see him climb to 24th on the leaderboard. POY contenders Fedor Holz and David Peters also cashed in this event, adding 298 and 119 points respectively. Holz now occupies the 25th spot in the rankings while Peters sits in seventh place.